The release of Ray Davies' first album in over a decade, Americana, and Dave Davies' new album with his son Russ, called Open Road, comes just over twenty years since the official 1996 demise of the Kinks, the legendary band the brothers once shared. Curiously, in the few years leading up to the Kinks' slow fade and breakup, two titans of Britpop, Blur's Damon Albarn and Oasis' Noel Gallagher, hailed the band as a major influence, the forebears of the "cool Britannia" ethos. While the Kinks never quite received the same Stateside love as their peers— the Who, the Beatles, and the Rolling Stones—the band and the Davies brothers are revered to this day by artists like Stephen Malkmus, Ty Segall, Paul Weller, and Bruce Springsteen. In the early '60s, bolstered by the rebellious romance of pirate radio stations, like Radio Caroline, that spun the Kinks' singles long before the BBC did, the band's initial lineup comprised of the singing (and dueling) north London brothers Ray and Dave Davies (the former playing rhythm guitar and the latter on lead), bassist and co-founder Pete Quaife, and drummer Mick Avory, churned out songs that were raucous and smart. Their early three-chord dispatches, like "You Really Got Me" or "All Day and All of the Night," were lusty, jagged bolts of very British garage rock powered by Dave Davies' blustery riffs. However, the Kinks also unfurled gentler pop confections like "Sunday Afternoon" and "Tired of Waiting for You" too. There was a delicious Englishness to Ray's lyrics; he wrote perceptively about upper middle class suburban ennui in songs like "A Well Respected Man" and mused on mod dandies in "Dedicated Follower of Fashion." The Kinks dared to record concept albums, notably 1968's brilliant The Kinks Are the Village Green Preservation Society, a masterpiece that artfully prodded at the British class system and the hazy nostalgia of village life, and 1969's Arthur (Or the Decline and Fall of the British Empire) which dwelled on post-war Britain and Australia. The Kinks were dealt a disastrous blow Stateside when, after one tumultuous 1965 tour, they were refused permits from the American Federation of Musicians to tour in the U.S. for a staggering four years, from 1965-69. Allegedly, their behavior was so rock 'n' roll during their first jaunt through the States (capped off by fisticuffs on the set of a TV show and another bloody fight between Dave and Avory), that they were shunned. "We were dangerous and America felt threatened," Ray told the Telegraph in 2014. "America felt safe until all the Brit bands like us and the Beatles and the Rolling Stones came along in the Sixties. But we helped change America, too. When we returned after the end of our ban the culture had been liberalised. Bands such as the Doors, Frank Zappa and the Mothers of Invention had grabbed back their culture." The Stateside ban in the midst of the British Invasion was a career-crippling setback for the Kinks, never the luckiest of bands. In the late Sixties they persevered through lineup shifts, illnesses, legal hassles, and an auto accident. Although their struggles became tougher (fraught marriages, brotherly battles, a drug overdose) their albums and songs were still bracing, idiosyncratic, and bold, even when briefly censored by the BBC (1970's "Lola"), not released in the States (the ill-fated Percy soundtrack), or cursed with good reviews but disappointing sales (1971's Muswell Hillbillies). The Kinks veered towards theatre for a spell in early Seventies, distancing themselves even further from the mainstream. They returned with a straightforward rock album, Sleepwalker, in 1977, which foundered in the UK but charted in the States, and had further success with singles like "A Rock 'n' Roll Fantasy," from 1978's Misfits, and "(Wish I Could Fly Like) Superman," found on 1979's Low Budget. Dave, who had brushed against a solo career after his British hit single, "Death of a Clown," released the first of his eight studio albums, his eponymous debut, in 1980. Ray wouldn't release his first solo album, Return to Waterloo, until 1985. But as the Kinks, their songs were resurrected and recorded by a new generation of artists too, like Van Halen, the Knack, and most notably the Pretenders with "Stop Your Sobbing" and "I Go to Sleep." The Pretenders' Chrissie Hynde and Ray became a couple for a spell and had a daughter, Natalie. Improbably, the Kinks were swept into the second British Invasion of the Eighties with the 1983 hit "Come Dancing," their most successful U.S. single, and a high-charting album too, State of Confusion. But although a Kinks video was on heavy rotation on MTV, sandwiched between Eurythmics and Duran Duran, the band had hit its commercial peak. Fractious relationships between bandmates, lovers, and their label spiralled: Ray and Dave; Dave and Avery; Ray and Hynde; and finally, the Kinks and MCA Records. After the disappointing release of 1989's UK Jive, they were dropped by MCA. A brief tenure with Columbia Records, which the Kinks last album Phobia in 1993, was also disappointing for the band. Following a tour in the summer of 1996, the Kinks broke up. Dave suffered a devastating stroke in 2004 and former founding member Quaife died in 2010. A Kinks reunion has always been a distant hope of the band's fans, further stoked in recent years by a Dave's slow and steady recovery, a thawing of the brothers' frosty relationship, and a surprise reunion of the pair at Dave's Islington gig in December 2015, playing "You Really Got Me" together for the first time in 20 years. There are demos that they've recorded and a biopic in the works by director Julien Temple too. But as Dave told Rolling Stone in April 2017, it's complicated. "I think with reunions, the Kinks have an amazing legacy," he said. "Why f**k it up by getting ourselves together to make a few bucks? Some things are best left alone. I'm saying that and half of me is saying it would be good to do a show or a TV thing. Or one song. There are a lot of different aspects to not doing a reunion. If my contribution was respected not just as part of a collaboration but financially as well ... no man is an island. We like to think we're in control of our lives, but it takes many elements and people." But for now, we have new albums by Ray Davies and Dave Davies and for that, we're grateful. 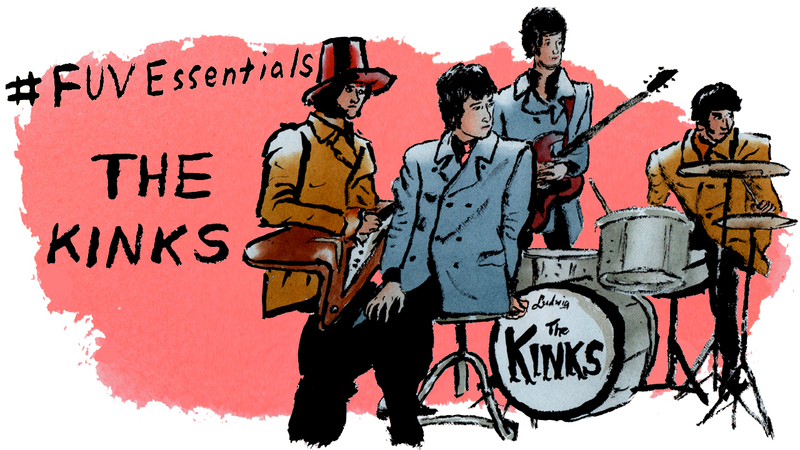 And it's why the Kinks and the Davies brothers will always be FUV Essentials.